After police ordered their mural destroyed, Gompers High School students fought back and are helping rewrite the rules on graffiti in Richmond. Gompers High School students in Richmond are repainting their mural. Gompers Garden is a wide sunny patch on the Richmond Greenway, a long, winding park following an old railroad line with a blacktop path for bikers, joggers, and pedestrians. The garden was founded by a group of students from Gompers High School, who filled it with fruit trees, flowers, and vegetables with the permission of the Richmond Parks Department. Last spring, the students decided to paint a large mural on a brick wall on a vacant building facing the garden. They requested and were granted permission by the building's owner.The students pooled their own money for paints and supplies, and completed work on their 5,000-square-foot mural in October. It was abstract and intricate, with cartoon characters poking their heads out from behind stylized indecipherable bubble letters of pink, orange, and blue, the words surrounded by swirls of color. But the students only enjoyed their accomplishment for a few days before Richmond code enforcement officers declared the painting illegal. It didn't matter whether the students had permission from the property owner, the officers said; they had not obtained permission from the city. City officials sent a notice to the owner of the property threatening to put a lien on it unless the mural was removed. Code enforcement officers pointed to a Richmond city ordinance that prohibits property owners from allowing graffiti on their premises under any circumstances. Faced with the prospect of city officials destroying their artwork, the Gompers students elected to remove the mural themselves. "They vandalized our art," said one Gompers student. But teachers Gretchen Borg and David Meza were determined to challenge the city to have the mural restored, and began contacting government officials and the American Civil Liberties Union. Meza approached the Richmond City Council at a meeting in October but said he was initially met with resistance. He and several Gompers students then met with Mayor Gayle McLaughlin, who Borg said was supportive of the students' rights to expression. "She wants Richmond to be a city of art and green, which of course this is an organic garden and a mural, so this is kind of exactly what she wants," Borg said. Phillip Mehas of the Berkeley ACLU heard about the Gompers students' mural in January, and was outraged that the city had ordered it removed. He called the city's anti-graffiti law "a classic unconstitutional ordinance" and raised concerns that it allowed the city to regulate murals based on subjective interpretation. "The taste of a government official doesn't determine whether a mural is permissible," Mehas said. Mehas found several other examples of murals that had been ordered removed by the city, including one at an east Richmond paint store and one at a local deli, and compared them to other murals in Richmond that had existed for some time. He concluded that city officials were regulating the murals based on whether they included graffiti-style writing and designs. "That form of expression coming out of that community has been squelched," Mehas said. At an April 19 meeting, after months of negotiations, the city council unanimously granted Gompers students permission to repaint their mural, and gave them $1,000 for supplies. The council also put a moratorium on code enforcement destroying any murals created with permission of the property owner, and began a process to revise the city ordinance pertaining to graffiti. 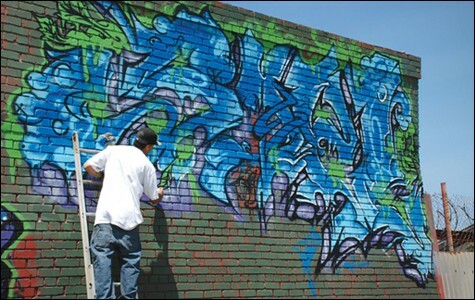 Since then, McLaughlin has held regular meetings to compose a new graffiti ordinance. A May 31 meeting at city hall was attended by city officials, Gompers teachers, representatives of neighborhood organizations, and community activists. Deputy City Attorney Scott Dickey outlined a draft of a revised ordinance his office composed based on community feedback and consultations with other city attorneys. The key distinction in the new ordinance is that it differentiates between authorized and unauthorized graffiti, defining unauthorized graffiti as public markings done without permission of the property owner. Under the new ordinance, the city would not be able to remove an authorized mural unless it was obscene. Some community members, however, have strong reservations about the proposed new rules. One concern is that the permitted murals may be vandalized by others tagging their signatures over the existing painting, blurring the line between authorized and unauthorized graffiti. 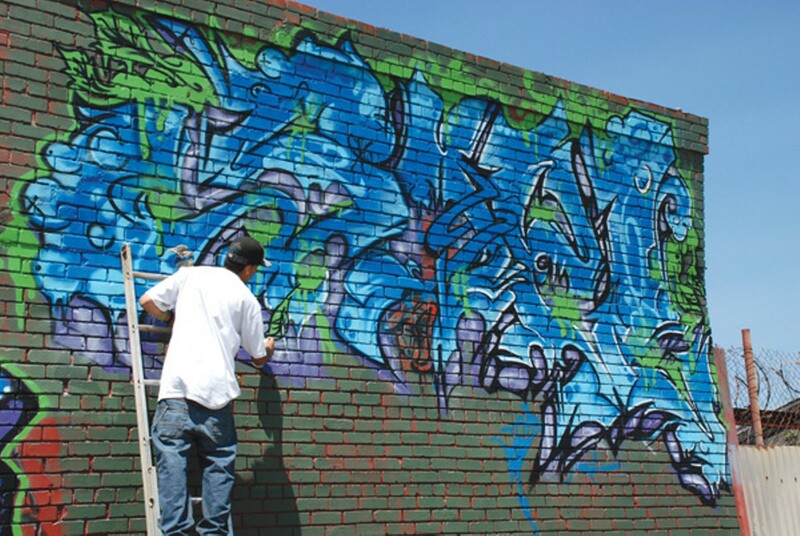 The question of whether the signatures are authorized also can be difficult to ascertain: Some artists who create permitted murals may elsewhere be doing unauthorized graffiti, leading the police to associate their name and tag with vandalism. Richmond resident Owen Martin has been voluntarily removing tags from city property for three years, particularly on street lights. He also recently assisted a local tattoo parlor in removing a piece of artwork that had been tagged over. Martin expressed concern that the relaxed rules on graffiti could hurt Richmond's image as it tries to attract more businesses. "We're trying to sell our community as a more business atmosphere," he said. "I wonder if we could just put the art inside in the first place." But Desi Wome, a graffiti artist and activist with the Oakland-based Community Rejuvenation Project, pointed out that murals attract less tagging than empty walls. He also said that keeping graffiti art indoors would be impossible given the medium's reliance on large walls and aerosol painting. "Personally, all I do is spray paint," he said. "It's impossible to keep that inside." Still, Richmond Police Captain Mark Gagan worried that the police department would need to field complaints about large art projects from neighbors. The role of the police has "shifted to a lot of issues really not criminal in nature," he said. "We certainly don't want to be the ones doing any kind of design review." Gagan wants the new ordinance to have very clear boundaries about what actions the police could take regarding public artwork. "I'm not as concerned about neighbors complaining so much as overstepping our boundaries," he said. Meanwhile, the Gompers students are hard at work repainting their mural and expect to finish within days. Once it's complete, there will be a celebration and ribbon-cutting ceremony. The new mural is being painted with a jungle theme, to fit the parks and gardens of the surrounding greenway. Giraffes, birds, frogs, snakes, monkeys, spiders, flowers, and vines populate the wall, winding through the warped, interconnected lettering. "We didn't want it to stand out in a negative way, we wanted to be harmonious with it. So we chose a jungle, we chose nature, and we used soft colors," said one of the Gompers muralists. "People would walk through it and just feel like it belongs with everything else in here." Gompers is a small continuation high school of 171 students. It offers alternative schedules for students that have outside responsibilities like jobs or children, or students that for various reasons have not succeeded in larger comprehensive high schools. After nearly a year, the identity of the Oakland police officer who shot Demouria Hogg was revealed in report clearing her of criminal charges. Todd Hansen, who recently left the Oakland Metropolitan Chamber of Commerce board or directors, boosted salary in alleged scheme.